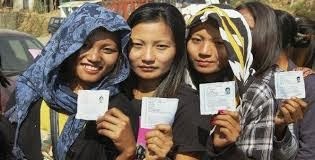 Aizawl, Nov 25 : Women voters will play a key role in the Nov 25 assembly elections in Mizoram, the only state in India where women voters outnumber men. Of the 686,305 voters eligible to exercise their franchise in the elections to the 40-member assembly, 349,506 are women and 336,799 men. In the last assembly polls in 2008, women voters outnumbered men voters by 6,644, and in the 2003 elections by 3,816. Mizo women contribute enormously to the economy of the mountainous state - the state's name literally means 'land of the hill people' - its domestic affairs, church and social activities but when it comes to politics, assembly and Lok Sabha elections in particular, they have remained in the background in getting due importance. Of the 142 candidates, only six (four percent) are women this time. The ruling Congress and main opposition Mizo National Front (MNF) have fielded one woman candidate each while three women are contesting on the Bharatiya Janata Party ticket. One woman is contesting as an independent candidate. In the 2008 elections, four women contested unsuccessfully. Since Mizoram became a union territory in 1972 and a full-fledged state in 1986, there have been only three women legislators - Thanmawii (1978), K. Thansiamii (1979) and Lalhimpuii Hmar (1987). Among them, Lalhimpuii Hmar of the MNF was a minister in the government led by the late Laldenga in 1987. Even in 2013, women in India's second most literate state Mizoram (with a literacy rate of 91.58 percent) after Kerala (93.91 percent) do not have adequate legal rights. With a total population of 1,091,014, of which 538,675 are women, 89.4 percent females are literate against the male literacy percentage of 93.72. "A man can divorce his wife at his whims and fancies without any reason. He doesn't have to pay alimony to his wife and women usually don't inherit the property also," said Lalnipuii, a women's rights activist. "The Mizo society is completely dominated by men. Women should get due importance in all types of governance." Mizoram Pradesh Women's Congress president Tlangthanmawii, who is contesting against Zoram Nationalist Party (ZNP) chief Lalduhawma and former transport minister K. Sangthuama of the MNF in the Aizawl West one seat, is also in favour of more women's participation in politics and governance. The Women Welfare Front (WWF), constituted by women members of village councils across the state, has been actively spearheading the campaign for women candidates in the assembly polls. "We are making all-out efforts so that we see as many women candidates as possible in the coming assembly elections. We have requested political parties to nominate as many women candidates as possible and we will appeal to the female voters to vote for the women contestants," WWF secretary Darhmingthangi told IANS. "No home is complete without a woman; so is the case with the state assembly. As much as we need women in our domestic affairs, we need them in the legislative system too." Mizo Hmeichhe Insuihkhawm Pawl (MHIP), the state's biggest women's body, has given full moral support to the WWF's initiatives. "Despite the women working hard in all sectors, they are deprived of getting their due share in the control of power," said MHIP leader Rozami, who was also chairperson of the Mizoram State Commission for Women. Congress leader Lalsawta said: "We have no problems in nominating women candidates if there are qualified and efficient women contenders." "The Mizo society in pre-modern times was strictly based on what is known as an extreme patriarchal society. This created 'private' and 'public' domain, where women were stigmatised to the private sphere that relegated their status in the social and religious life," sociologist Subhankar Goswami told IANS. "Women therefore had no opportunities to go beyond the scope of the 'domestic sphere' and it was only men who controlled and dominated the entire 'public sphere'. They were not supposed to have any independent religious loyalty, but were required to follow the religion of their husbands." "Christianity of course is the harbinger of 'modernity' as well as women's liberation in Mizoram. The Christian missionaries are regarded as a symbol of 'modernisation' that led to gradual changes in the conservative attitudes of men towards women," he said. In mizoram polls women's play a important part in the women voters. These women's is playing such an important part in this https://www.australian-writings.org time. So we must help them to take a part in doing work for the others. So trying to take a different work in which they show their work. Word Press is a great blogging stage which makes being effective less demanding. The key is to knowing a portion of the tips about best papersplanet and traps that make it address our issues. so we can say that persistent perusing of this article with respect will be significant for Word Press.